Welcome to the NES Spectrum Marathon 2018! The NES Spectrum Marathon is a new, hopefully annual, charity marathon stream in which we play video games on the NES, that you choose!, for 50+ hours. Each of us have friends and family who either have autism, or have children who are affected by autism. In doing research for which charity we wanted to raise money for, the Organization for Autism Research seemed to be the most honest and transparent of the autism-related charities. 100% of the money you donate to us will go straight to the OAR organization, and from that money, 87% of it will go directly to the research and services that they provide. All donations, of course, are 100% tax deductible. Inspired by the NESathon, a similar charity marathon stream that raises money for the MS Society of Canada, we wanted to host a similar event for a cause that affects many people that we love, or their loved ones. The creators of this event are Kevin Hanley, a NES programmer who has released many games for the NES system, as well as his good friends, sisters Kyndal and Chelsea Howard. 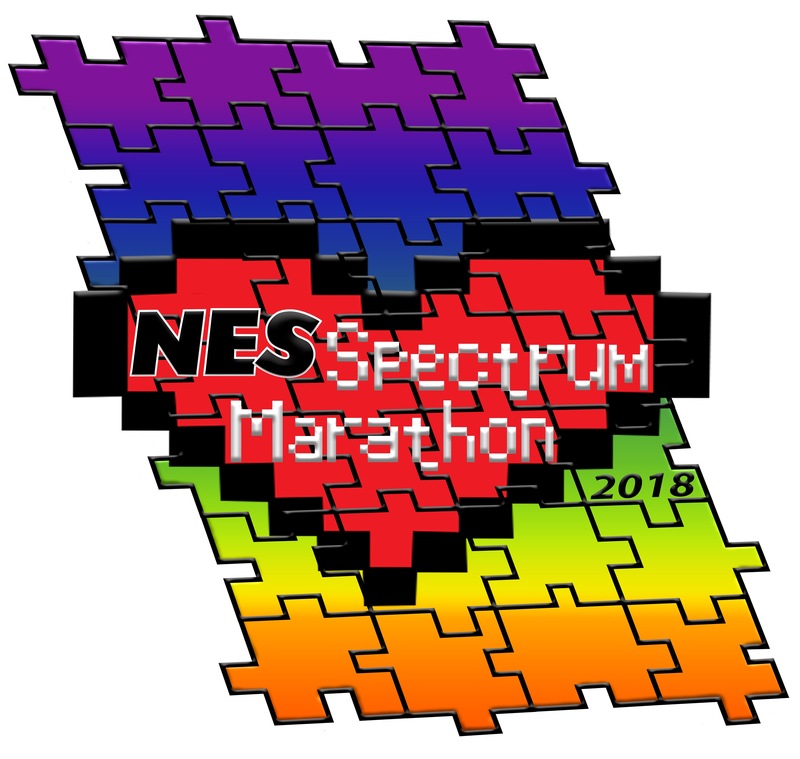 The 2018 NES Spectrum Marathon will be taking place September 7-9. It will begin on September 7th at 2pm central standard time and run for 50 straight hours. After the 50 hour mark, the marathon will continue to go until the donations stop and we have played all of the games that were donated for. Over on Twitch! Head over to twitch.tv/nesspectrummarathon and tune in! Watch all you want, chat all you want, and more than anything, enjoy yourself! We are doing this because we love retro games and we want to share this love with everyone, while raising money for a great cause that we care greatly for. Come hang out! We fully intend to play the game you donate for as long as we can, giving it a very good attempt. Please know that 1) the length of time that we play a game is inherently dependent on how many games there are in the current queue and 2) There are 776 games in the American NES library (not to mention lots of fan translations, hacks, foreign games, and homebrews) so there is a very good chance that the person(s) playing the game(s) you donated for have never played them! Go easy on us, and if you have hints/tips/tricks you'd like to share, please do! We encourage and appreciate all feedback and interaction! For every game you donate for, you will be awarded one entry into our prize raffles. When you click on the Donate button, there will be a place for a "Donation Message." It is in this box in which you will type the games you would like us to play. We are using a flash cartridge with all games available on it, so any of the original licensed and unlicensed games will be availalble for your donation request. If you are a developer or game hacker and you have an original creation you would like us to play, this can be arranged as well. Please go into the Twitch channel chat and let it be known that this is something you would like and we can work out the details there. Many prizes have been donated by our generous sponsors, and will be up for grabs for all people who have donated. Three rare Nintendo themed Happy Meal toys. retroUSB Mystery Box (Trust me... it's good). Many, many thanks to our generous sponsors. Derek Andrews has been one of the leading voices in NES homebrew for going on a decade. He has released two incredible games for the NES, as well as a sound engine that he allows others to use to easily implement music and sound effects into their own NES creations. His two additions to the NES homebrew library, Nomolos: Storming the CATsle and The Legend of Owlia, both received critical praise upon release. The latter, Owlia, has been compared to The Legend of Zelda, and the beautiful graphics, done by Derek's wife, Laurie are easily among the best seen on the system. They are currently working on a new untitled platformer to be released in the near future. Their first two games can be purchased in physical form from infiniteneslives.com and also downloaded for free on their website. Rob Bryant has been a mainstay in the NES scene since its first forays into emulation as the internet developed in the mid to late '90s. Considered one of the greatest NES gamers of all time, he is known to have beaten almost every NES classic, especially those considered at one time to be impossible. The Ninja Gaiden Series, Golgo 13, Ghosts and Goblins, Nightmare on Elm Street, and many more fell victim to Rob's talent and tenacity. Rob began acquiring a following online when he started releasing a series of videos detailing his tips and strategies on a website he created called playthenes.com. Quickly transitioning into NES programming, he has now released a number of games now considered classics in the homebrew scene. He is currently working on an elaborate series of games called the Candelabra series, two of which have already been released, The Mad Wizard, and The Rise of Amondus, both of which can be downloaded for free at his website as well as many other games he's made in the past decade. Paul Malloy began making NES hardware straight out of college to help fill a growing demand that he saw "brewing" in the homebrew scene. Introducing an alternative to the flash boards that were created by retroUSB, Paul also introduced a new cart flashing system called the Kazzo, which is used by many homebrewers and reproduction makers alike. Also featured on his website are a number of homebrew games which he produces and distributes for various developers including Lizard by Brad Smith and Armed 4 Battle by 1010 Howe. Paul also volunteers his services every year to produce a cartridge featuring every game entered into the nesdev homebrew competition that respective year called Action 53. All of this and more can be found on his website infiniteneslives.com. One can't discuss the NES aftermarket game and hardware scene without mentioning Brian Parker from retroUSB. Many times. Brian almost single-handedly propelled the homebrew scene (at least in a physical form) into existence when he introduced not only new, original PCB boards to put newly created games on, but also created an injection mold to produce new cartridges to house the games on, and in various colors! With the release of Sudoku by Al Bailey back in 2007, the homebrew scene was offically on thet map. The first game released with all new parts, many followed, including Ultimate Frogger Champion and Battle Kid. In addition to creating all new parts for homebrewers to create with, retroUSB also released the PowerPak, a flash device that developers (and consumers alike) could load games onto to play on their actual NES consoles. But Brian had bigger dreams, and followed this creation up with the AVS, a brand new system that allowed gamers to play NES and Famicom games in glorious HD featuring compatibility with all of the original controllers and peripherals that worked on the original systems. Brad Smith is what we call a "real programmer." He didn't just decide to start making his dream game in his basement in his spare time after hours... he actually found himself moving to California to work for a game company creating AAA titles for major publishers. But this didn't scratch the itch he had to create the game he wanted to make. One of the first developers to use Kickstarter to fund a major NES project, Brad Smith created Lizard, one of the most polished and creative games to come out on the NES system. Lizard, billed as a self-exploration non-combat platformer, redefined how we classify homebrews and games in general. It pushed the limits of what we can do on the system with incredibly fluid animation, incredible boss fights, and ambient music. It's been described as the best homebrew of all time, and while some might argue that that distinction might go to The Mad Wizard (hey, I'm doing the writing here. ;)) it is certainly in the discussion. Brad has also been a driving force in homebrew tool creation and created a wonderful cover album of Pink Floyd's Dark Side of the Moon. They don't have money, but they have some good ideas! Broke Studio, formed in France by three incredible creatives, got everyone talking when they released a small demo of a game they were working on entitled Twin Dragons. To fund the creation of the full game they took to Kickstarter, where they found a receptive audience who waited with bated breath for the game to arrive. Twin Dragons features ... well, twin dragons... named Dinky and Minky who are on a quest to find the egg housing their future sibling. The egg was stolen by an evil sorcerer from a neighboring village and it's up to you (and a friend!) to save the day. The company that coined the phrase "8-bit legit" and turned the homebrew scene on its head hails from the great state of Pennsylvania. Formed by childhood friends, they burst onto the homebrew scene and before anyone even knew what was going on, they released the incredible game, which was to be the first in a series, Haunted Halloween '85. Pulling on the nostalgic heartstrings of fans of the classic River City Ransom franchise, fans quickly found familiarity and fun in the Haunted series, throwing pumpkins, killing zombies, and dodging ghosts. Building on the success of their first game, they followed it up with the even better and deeper Haunted Halloween '86. They developed a loyal following, but not ones to rest on their laurels, and wanting to show that they were much more than a one-trick pony, they returned to Kickstarter to seek funding for a completely different type of game, this one called Full Quiet. Production is still underway on this game, but the Retrotainment guys are always mainstays at the festival and convention circuit, so definitely seek them out when you see them! Musician? Artist? Performer? Teacher? Attempting to describe Sergio is borderline impossible. Where does one even begin? First and foremost Sergio is a lover of all things video games. Oh, and music. It was only natural that he combine his two great loves and create something wonderful. Sergio has contributed to a number of projects, both released and not yet released, most recently contributing music to the Ninja and Ninja 2 NES homebrews, but he is probably best known for being the frontman for his music group Sergio and the Holograms, where he performs classic video game tunes live and in concert. He also holds the distinction of releasing a first-of-its-kind NES cartridge, entitled A Winner is You, which houses full-cd-quality audio of one of his first records. And you can listen to it on an actual NES! A far cry from the primitive four-channel audio we've grown accustomed to hearing from the system, for sure. Shaun always loved the NES and as the age of the internet grew into prominence and research was more easily done, he found that there were tons of games that came out for the NES in Japan and Europe that we never saw in America! Fascinated, he downloaded and played them and found that some of them were actually really good! "Man," he thought... "if only I could have this game on a real cartridge to play on my NES." Sadly, this technology didn't quite exist for a hobbyist to delve into. Fast forward a decade and Shaun now has become one of the most well respected and established reproduction creators in the scene. Starting out just making them for friends, his demand grew to the point of opening an etsy store to show off his wares and keep track of order communication. Pairing up with This Room is an Illusion to sometimes create boxes and manuals for his products, Shaun's games are now enjoyed by people all over the world, including myself. Have you ever wanted to find out more about a homebrew game, but didn't want to spend the time reading a lot of boring text (like you're doing right now)? Well, you're in luck. Peek-a-Brews! is an alcohol-fueled let's play/review YouTube show featuring various homebrews that was created in an attempt to get the word out more about some of the developers and games that we know and love. Past episodes have featured such games as Battle Kid, Lizard, Super Russian Roulette, and many more! Be sure to subscribe and join in as they take a close look at various NES goodies. In interesting ways! Orab Games is a game company headed up by programmer Tim Wurdinger. Hailing from the great state of Nebraska, Tim is a diehard Cornhuskers fan. Wanting to bring some of the fun and excitement that he experienced while tailgating at football games, Tim created Tailgate Party, a beanbag toss game which utilizes the Power Pad, a peripheral that had previously been used for Track and Field and Dance Aerobics type games for the NES. Featuring both single and multiplayer game modes, Tailgate Party allows you to compete against AI controlled grannies, as well as your best friend in real life, who you will obviously take down while sipping on some ice cold Keystone Light. Starting out as solely (pun intended) a game publisher, Sole Goose Productions released a few games that others had programmed, namely Swords and Runes and 0-to-X, all the while dreaming of releasing his own dream project, some sort of silly RPG with grand scope and deep characters. While he hasn't quite finished the game that he goes to sleep dreaming about, EBD Holland has released a Kickstarter darling entitled Spook-'o-tron, a dual-stick arcade shooter reminiscent of Robotron 2084 from the early '80s. He is currently working on a few things, an Oregon Trail-esque game called Family Vacation, as well as the aforementioned dream RPG. A programmer by trade, Nathan Tolbert's passion and love for classic gaming spans many systems. Planting his roots creating homebrew games for the Atari 2600 like his adventure game called Anguna 2600, Nathan quickly moved on to creating some truly unique and fun titles for the NES, including Spacey McRacey and Robo-Ninja Climb. His projects have been featured in numerous nesdev homebrew competitions and he has been interviewed on podcasts like The Assembly Line. As if that isn't enough, Nathan has taken his Aguna series to the Gameboy Advance and Nintendo DS. For more info, please check out his website. Justin Orenich lives and breathes NES homebrew. Beta testing for numerous projects by a multitude of different programmers, Justin quickly established himself as a reliable and dedicated tester, suggesting many ideas and changes that would define and shape projects that wouldn't have been nearly as good without his creative input. As the brainchild behind Neodolphino Productions, Justin has released some games that some of us who grew up playing classic computer games would recognize, Minesweeper and Free Cell, both of which he has released on the NES as UXO and Free Cell, respectively. Matt Beppler doesn't do anything, really. I mean, he beta tests some games, but anyone can do that, right? Recently though, he got married. I doubt he'll even have time to beta test anymore. But I'm getting off track here... Back before he got married, he was pretty much known for one thing: loving Christmas. So he did what any Christmas lover would do, he commissioned some people to make a Christmas music cartridge for NES. It came together pretty darn well. You can win this very music cartridge if you're lucky! Thanks Matt. Benihana Rocks 09/09/2018 $123.45 Play some flight sims for goodness sakes. Andrew Arnette 09/08/2018 $10.00 I’d love to see you guys play contra! Keep up the great work! I hope you reach your goal!! Mike L 09/08/2018 $20.00 I would like an on screen coin flip to decide between Faxanadu and Guerilla Wars. Elaine McIntosh 09/08/2018 $20.00 From TheSfid's mom and dad. Anonymous Friend 09/08/2018 $20.00 Would you play Marble Madness? David Patterson 09/08/2018 $10.00 Get Joe and Shana to play some Jackal! Nioreh . 09/08/2018 $20.00 I can't believe nobody has requested Castlevania yet. So.. Castlevania. Nicholas Ringer 09/08/2018 $35.00 8 bit x mas 2011 4 player and famicom samurai pizza cats if you have it or kid dracula. Charles Kelly 09/08/2018 $60.00 Cheers from the LowT Gaming community. Your stream was shared in our community. Hopefully more of our folks stop by! R Nicholson 09/08/2018 $20.00 Stooperzero on NintendoAge. Hows bout Play... "Cobra Triangle"
Emma Patterson 09/08/2018 $10.00 Hi Aunt Shana and Uncle Joe!!! Matthew Beppler 09/08/2018 $50.00 Any games. MICHAEL CHIARAMONTE 09/07/2018 $80.00 Thanks for doing this Kevin - excited to watch this and it's for a great cause. Chris Cacciatore 09/07/2018 $20.00 Jackal please! Jim Richardson 09/07/2018 $20.00 Please play Mike Tyson's Punch-out! Nicholas Ringer 09/07/2018 $35.00 Play Ice Hockey and 20 minutes of dragon warrior, ( I don't expect you to spend 10 hours playing dragon warrior). Dragonwarrior83 from NA. Knutur Sveinsson 09/07/2018 $35.00 Bucky o’hare and kickle cubicle. Matthew Quackenbush 09/07/2018 $40.00 Thanks for doing this! Very happy to support this cause! Brock Heinz 09/07/2018 $65.02 Love the podcast, it's great that you guys are doing this too! Good luck! Kevin Hershberger 09/06/2018 $50.00 Great cause and great guys hosting this event! Dave Kolesar 09/06/2018 $20.00 From captmorgandrinker Rollergames! But you have to start as Icebox (the bigger character). After you die, go ahead and use the pink haired chick. Anonymous Friend 08/30/2018 $2.00 So misunderstood during its lifetime, Sneak n Peek will be memorialized on this day every year with a cart lighting ceremony. Kevin Hanley 08/25/2018 $1.00 Play anything but Sneak n Peek.